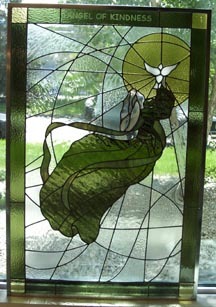 These panels were comissioned to compliment already existing stained glass panels. 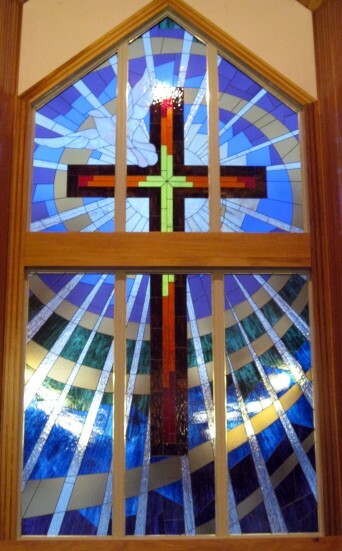 The entrance way to St Matthew's Church was renovated and new window sets were added. They had 5 existing panels but now had 8 spots so using the style of the original panels and working with a window comittee, we built 3 more sets of panels matching everything as closely as possible. 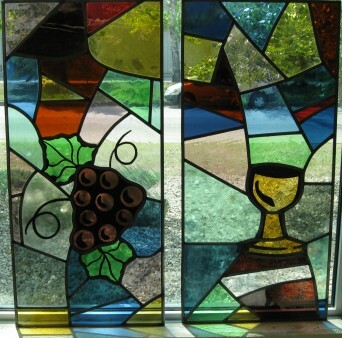 From the painted elements to working with all hand made glass, these windows were fun to build. 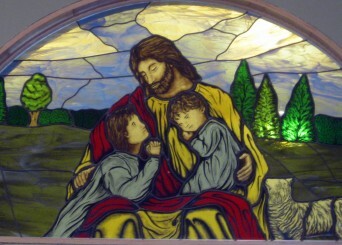 This window panel already existed. We painted a crest and writing and then had to disassemble and cut into the panel to insert the crest. 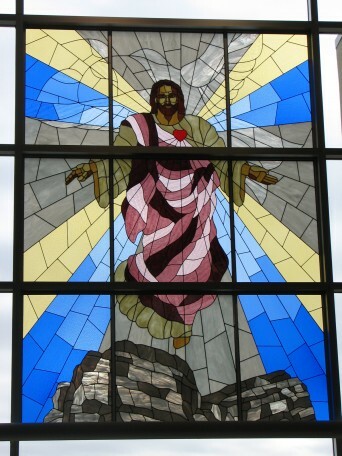 To add to the excitement the window was located 40 feet above the alter. 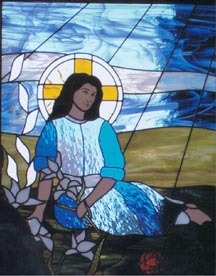 This half round panel was created for an interior wall, for the Associated Gospel Church in Provost. 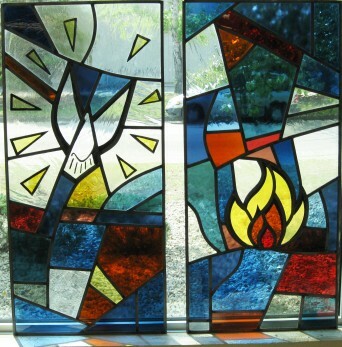 It is quite a large piece and sits over the double doors that lead into the chapel. 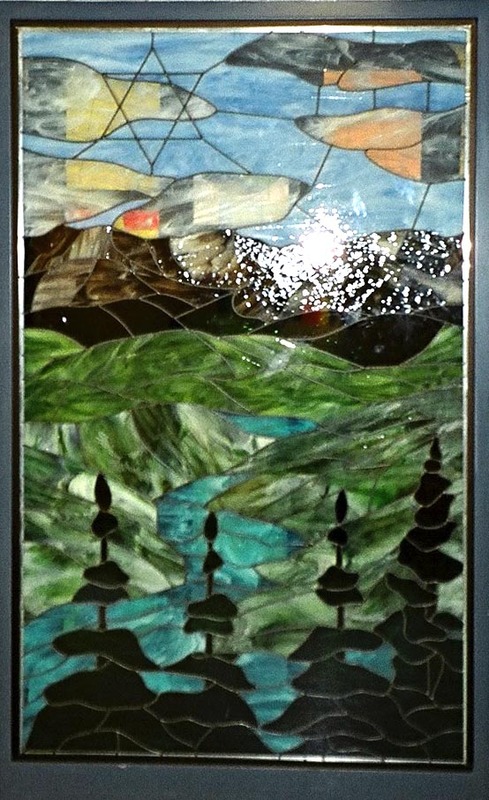 These 9 panels were built for the school's library, each panel is approximately 4' by 6'. 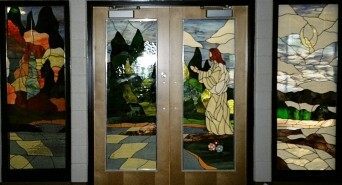 Holy Redeemer School in Edson commissioned these 4 panels for the entrance way of their chapel. 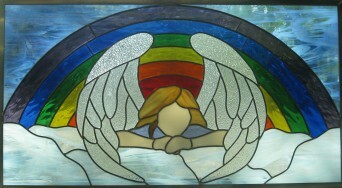 They represent the 4 seasons as well as some of the surrounding area. They also have various symbols through-out. 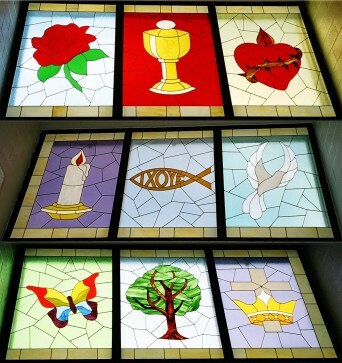 This set of nine panels were built for the library in Holy Trinity School in Okatoks, Alberta. 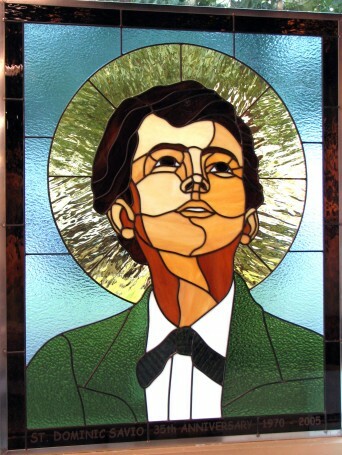 The school was looking for traditional imagery in a contemporary style. 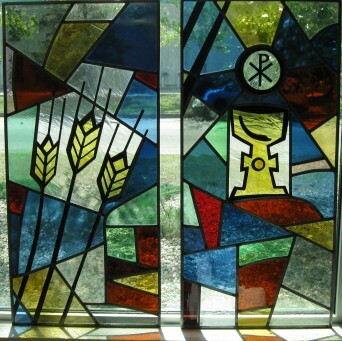 We incorporated the Holy Trinity along with some of the local landscape. This pair of panels were built for Holy Acension, a small Orthodox Church just outside of the city. To keep with the traditional nature of the church, a traditional iconic image was used, and the figures were painted. 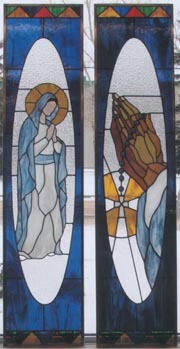 These panels were built for a church in Grande Prairie. Each panel is approx. 4' x 6' and were built using a couple of different widths of flat lead to "outline" the images. 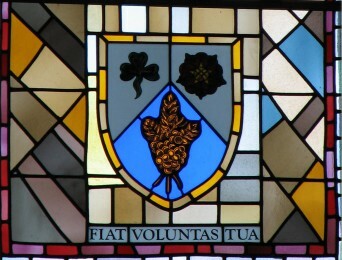 The consept and design was created by a member of the churches. 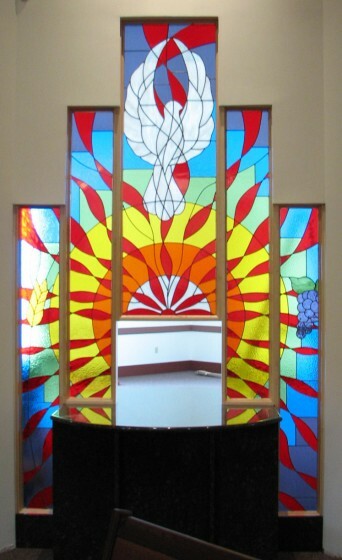 These 5 windows were done for a church in Grande Prairie. 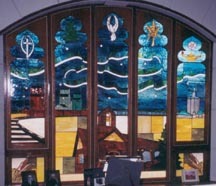 The panels are set within an interior wall with the tabernacle set in the center. 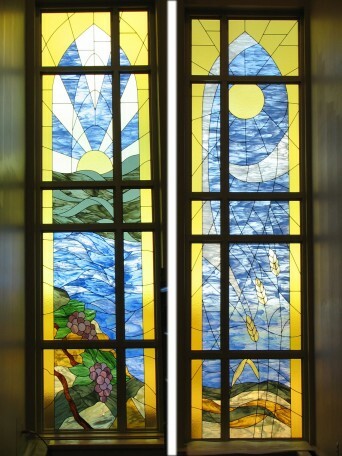 These 20 panels make up 2 towers on either side of the alter at Mary Help Of Christians Church. 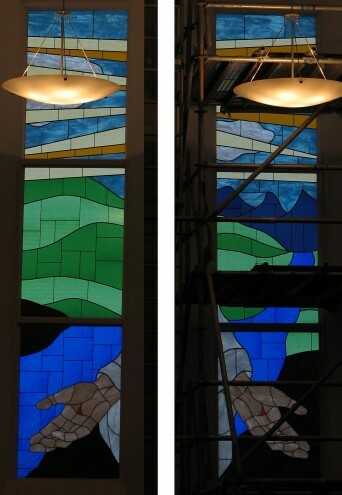 The 10 panels on the left represent the Old Testament , the 10 on the right represent the New Testament. 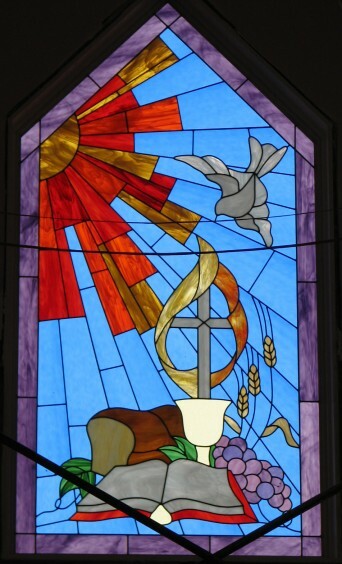 Although built in traditional leaded glass, we tried to represent the style of the dalle de verre windows already in the church. 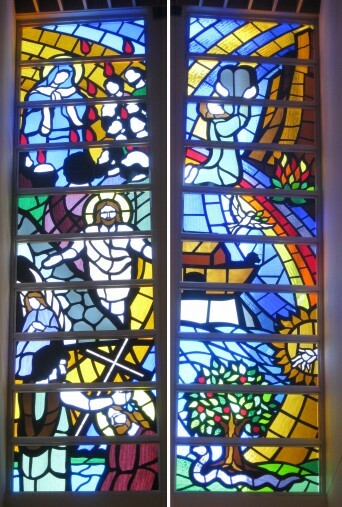 The windows were to depict different events in the life of Mary. 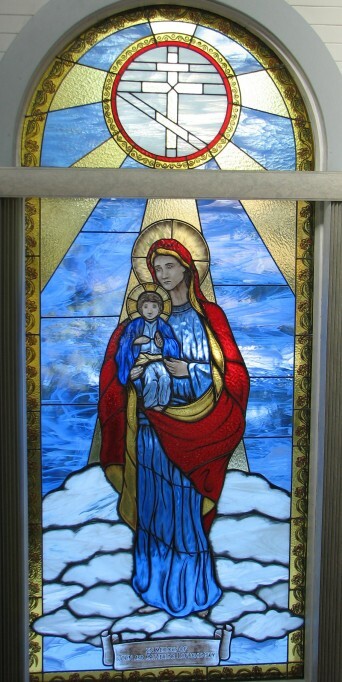 allow for the windows to elegantly tell the story of Mary without being over bearing in the small church.